I saw this with the D800 and now we're seeing echoes of it with Sony A7 and even some other cameras: self reinforcement on the part of the purchaser. When you buy a US$3000 camera (or even a US$1000+ camera), it's going to be rare that you then proclaim to the world "I was a fool, this thing isn't worth the money." Indeed, the opposite is true: you're likely to trumpet "this is the best thing since [the last best thing] I've purchased." Essentially, you're reinforcing your purchase decision. The problem for a camera maker is that some of those self reinforcements come from a real place, some do not. Smaller/lighter and simpler more traditional controls (actually "don't add new things to learn that I can't figure out without reading your manual ten times") are definitely showing up on the buying trend list and are real. 36mp, not so much, partly because of the costs involved. People want to think they own the "greatest sensor ever made [until the next one]" but they're not actually using it well. nor do they want to buy lots of new expensive lenses to exploit the sensor. It's just a brag point ("hey, look at me, I've got a bigger better sensor than you."). Full frame falls somewhere in between real and brag point, while mirrorless is likely the future due to cost/part reduction needs, so we need to pay attention to that trend. Unfortunately, the camera makers are desperate for any sales, any hot product, any profit potential. The more desperate amongst them will observe these amplified self reinforcement gushes on the Internet and aim their products right at them. Unfortunately users are the worst product designers in the world, so following customer's publicly stated desires often leads you places that are tough to get out of. The only camera maker that hasn't clearly succumbed to the "follow the shouts" form of design so far is Canon. Sure, they've tested some waters with a smaller/lighter DSLR and an even smaller mirrorless camera that devolve from their DSLRs, but those are natural progressions given the "real" needs in the market. Some might say "Canon's behind, Sony is going to eat their lunch." Evidence so far suggests that Canon still has a far bigger plate than Sony has and Sony's plate isn't empty yet, so that would just be more hyperbole for the moment. Canon has the most to lose by getting decisions wrong and following the user claim of the moment, so I don't expect them to do what Sony has and basically throw a huge number of different camera designs on the market to see which one sticks. Canon also has other businesses that can help stabilize their overall business as the camera group tries to figure out the proper future course. So they can risk being a bit conservative in trying to figure out the changing camera market. Not so, Nikon. Nikon is a still profitable camera company with a small and poorly performing semiconductor equipment business and an even smaller money-losing miscellaneous optics group. The Df shows that Nikon succumbed to one of the user self reinforcement proclamations: retro. Nikon also has to watch what Sony is doing warily, which makes the Df even more puzzling: it's not a response to what Sony is doing, but more to Fujifilm, who's not a threat to Nikon. 2014 is going to be interesting to watch. There's great potential for disruption at all levels. Sony is even actively disrupting themselves by making compact, mirrorless, and DSLR type cameras with the same sensors and basically trying to ramp up four different lens lines (plus a fifth fixed lens quasi-line for the compacts, and I'm not even counting all the things happening on their video side). Good thing they have Zeiss', Konica/Minolta's, and Olympus' help with those lenses. Everyone has full frame. Fujifilm, Olympus, and Pentax will probably all succumb and show their full frame hand either at Photokina this year, or no later than early next year. Sure, the volume will be low, but look at the profits! Pentax is the easy call here, but Fujifilm will have seen and envied the Sony thrust with the A7 and likely follow. Olympus can't survive as an m4/3-only company in my opinion, so they're going to have to come up with a second line strategy, and full frame would be as good as anything for them now that they're emphasizing high-end, especially if they tried to preserve the small/light OM legacy. Everyone adjusts their mirrorless. No one has quite got their mirrorless line right yet. Besides some things that still have to improve (AF for all except Nikon 1), the hoped for boost from women and the young hasn't quite been there and most of the products that aren't DSLR-like aren't getting buzz. We'll see more EVFs for sure, but at the lower end we'll see more experimentation. Sony, by killing the NEX name and bifurcating the E-mount, now has a tough marketing hurdle to get over, too. Megapixels are still in play. Heaven forbid, but the top DSLRs don't even match the top smartphone in pixel count. That can't be! The other half of the sensor buzz (full frame being the first half) is 36mp right now, with 24mp being "the norm." This poses a problem for Nikon, Olympus, and Panasonic in the mirrorless game (see previous point), but it also poses a problem for everyone except Nikon and Sony in the DSLR game. Even for Nikon and Sony there's need to push forward to keep the "pixel crown." Something will probably pop up, at least in prototype, with the 54mp sensor that's being developed. The exclusivities on the 36mp sensor expire in late 2014, too. Smaller/Lighter is real, and gets reinforced. So far this hasn't killed the Canon and Nikon DSLR sales, but left unchecked it will certainly hurt them. Virtually everyone who's a DSLR user also buys a convenience camera. More and more they're buying Sony RX or one of the mirrorless systems because they're adequate on the IQ/features but are far smaller/lighter. Panasonic's GM1 is looking good, too, and the mini-DSLR notion of the EM-1/EM-5 and NEX-6, NEX-7, A7 have gotten traction, too. Even the Nikon V2 plays into that well. So we'll see far more in the lighter/smaller push, especially since miniaturizing is something the Japanese engineers are really good at so the problem is right in their wheelhouse. Note that Canon and Nikon are aware of this one, as virtually every new DSLR release is now touted as being smaller/lighter. Wait, I didn't mention retro. Sorry, but I think this is a faux path to follow. At least the "make it look like the old cameras" part of it. Sony, I think, is finally getting this almost right: take a long hard look at the RX-10. It's got some retro to it. There's an exposure compensation dial for example. The built-in lens has an aperture ring. Indeed, if you look at the controls there's a fair amount of "retro" in the design. Yet it's all been modernized and put in a very modern looking package. That aperture ring for instance? Click stop apertures don't work so well for video users, so you can flip a switch and make the aperture ring continuously control aperture size. Whoever was at the core of the RX-10 design did a lot of things very, very right. Respect the controls we've used in the past because some of them evolved to be the right ones and aren't broken. But don't slavishly go back to the files and find the exact rings and dials that were used in the 70's and 80's and put them on a modern frame. You can learn from the past, and clearly Sony has. Bravo. Nikon, not so much, as I pointed out in my review of the Df. The Nikon approach seems the opposite of Sony's: Nikon was slavish to what they did in the past to the point of adding handling issues to what should be a great camera. The WiFi with smartphone app push will hit flood stage. This is how the camera companies decided they'll live with the smartphones. Sure. Uh, did you actually think about how they should live with our computers? While the WiFi-to-smartphone isn't exactly a self-reinforcement parameter of note, it's the only thing the camera makers have seen that seems to let them play in the future of connectedness. They seem to have forgotten that there are other avenues of connection they haven't addressed. Uh, Nikon, did you miss the memo with the D3300? Lenses are hot. See that chart? Didn't expect that, did you? While 2013 is looking like it will be somewhat down from the 2012 peak (DSLR and mirrorless kits will impact this number, and those sales are down), lenses have been a relatively bright spot as everything else turned significantly down. This had to catch the eye of every manufacturer, plus, of course, all the new mounts have plenty of holes to fill, so lenses will be a place of much energy in 2014. Lenses, however, aren't "instant on" things. From final concept to release Nikon tends to have a three-year cycle that's tough to break, especially if the lens requires any special glass elements in it, which, of course, most modern lenses do. 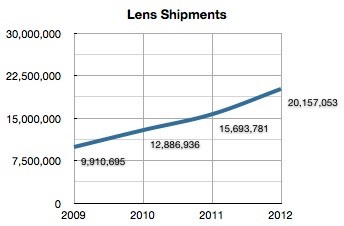 Thus, if someone at Nikon (or any other company) said "hit the accelerator on lenses" back in 2011, then 2014 would be the year we'd see the results. Compacts are back, kind of. The low end compact camera is dead. But the high end compact isn't. Sony proved that with the RX100 and then the other two products in the RX line, and the Fujifilm X100s is another marker. Canon and Nikon will have to respond in kind, and the others looking for profit will be sniffing out this arena, too. It's not like you can just fire your compact camera design team in Japan, after all. Still, it's a tricky and evolving space without a ton of sales yet, so I think we'll see more test shots than salvos. A water shed year. a small self-reinforcement message that didn't rise as high as the others I mentioned earlier is waterproof/weatherproof. A few folk that bought one of the well gasketed and protected cameras did shout their delight at being able to shoot in any weather, and that had already been something that the camera makers noted in the declining compact camera market. We'll see more poking and prodding at this, as weatherproofing is a very sellable feature, and the camera companies have finally noted that. Still, virtually none of what I'm projecting to see in 2014 really gets to the core problem of the camera makers: what is it that could re-ignite buying to the point where cameras are once again a growth market? It's the billion dollar question, and as of today, still unanswered. History tells me that it's less likely to be hardware than software at this point. While a hardware change could be disruptive and reset the market, the thing that's not being done is solve user problems, and that's where software usually comes into play. The thing that I keep coming back to is this: give me any camera hardware design in existence today and the right group of software designers and programmers and I could make that camera better for the user. Far better, I think. Heck, on an Olympus OM-D all we'd have to do is name things well and organize the menus and we'd be worshipped forever. Unfortunately, I don't think camera software is going to get better in 2014.